Today is the LAST DAY to enter the Elephant Minky Stuffie Giveaway. Don't miss out! For full information on these adorable little critters from Little Tumblebees, please click here. In times like these, who doesn't love a giveaway!? 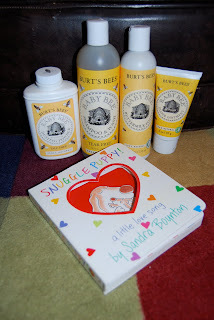 For more giveaway fun today head on over to From Chalkboards To Strollers, where Liz is celebrating her daughter's 1st birthday and her brand new blog design with a fantastic Burt's Bees and Snuggle Puppy Giveaway. Woohoo!! On a not so wonderful note though, you may or may have not heard that Similac has recalled nearly 5 million tubs of baby formula due to the fact that there were beetles/larvae in the powder. So disgusting. I am a breastfeeding mom myself, but I feel for any parent who is dealing with this right now. Please switch to a different formula, and I pray that your child's transition is an easy one. For the full details on the story from MSNBC, please click here. As my daughter approaches her first birthday, and at the same time rapidly outgrows her rear-facing infant carrier, my husband and I began the search for her "big girl car seat" a couple months ago. The first thing we learned was that EVERYONE HAS AN OPINION. Which of course you know is true for most parenting topics. The bottom line is that some people will say you're a bad parent no matter what you do, so try to make the best well-educated decision you can for your family and don't be ashamed of it. There is a lot of new literature about keeping children rear-facing for as long as possible. For our family, AJ is outgrowing her infant carrier extremely fast, and even though there are convertible carseats that still will work rear-facing, a lot of cars will not fit them that way (including ours). For our family, we have decided to keep her in her carrier until she turns 1 in November, and then use a forward facing carseat. General rule of thumb is for a child to stay rear-facing until they are 1 year old and at least 20lbs. When reading the suggested fittings for most carseats the other day at the store, I noticed that infant carriers are suggested for children "5-20lbs and 18-29 inches long" whereas convertible, forward facing carseats were suggested for children "20-60lbs and 34-48 inches long." Maybe it's just me, but what are kids supposed to do when they are between the heights of 29" and 34"? This is really a case for parental discretion. The car seat that we decided to purchase is the Safety 1st Complete Air Convertible Carseat. I cannot say enough good things about this car seat! We "tested out" a lot of floor models at a local department store before purchasing ours. It's important to look at the way the car seat works and to decide if it is going to be a good fit for your child/vehicle before purchasing. This model from Safety 1st has incredible side protection that are literally made out of little air "pillows." You can learn more about this new technology here at the Safety 1st website. This one is a little bit pricey, but I think that it's definitely worth it, for my peace of mind and the safety of our little one! At what age/weight did you transition your child into a forward facing car seat? Do you have any car seat tips for me? I'd love to hear from you! Please leave a comment below or email me at hollyatnaptime@gmail.com! And please, if you have any questions or doubts about the way your car seat is installed, visit your local police or fire department. These community professionals are trained in making sure that seats are securely and safely installed, and they are happy to help you out! If you or someone you know is having trouble affording a car seat, please direst them to their local Department of Health for assistance programs. Car seats are the law! Be careful, most children outgrow their carrier by 6 months old. Check the height and weight on your individual carrier to make sure you're within the limits. Also most rear facing car seats, other than carriers, can also be used forward facing. When I was trying to get the girls forward facing seats in as snug as I could I would kneel on them...if I was able to belt it in tight with MY weight on it, there certainly was no wiggle room or slack with the girls in their seats. Even though she's old enough not to and hates it, I still make Jordyn sit in a booster seat! Thanks so much for blogging about my giveaway, so sweet of you (you don't have to but just in case you want to, blogging was worth 4 entries so you can go back and leave 3 more if you want). I entered your giveaway too! The elephant is so cute!! I know what you mean about the carseat thing. We got a little bit bigger infant carseat, up to 32 lbs, but we have also started looking for the next one. The one you got is actually on the top of my list. It's a great one and I agree, the extra cost is worth their safety! Hi, Thanks for the blog award! Post coming soon. I have to admit.. I'm a crazy car seat lady ;) My almost 22 month-old is still happily and comfortably rear facing. I've found that you can rear face convertable seats in almost any car in the middle of the back seat. I had a Jetta and could fit the same Safety 1st Air seat in it! And, convertable seats are for children from birth - toddler so there isn't ever a height gap!